Here’s a full solution to solved and fix Samsung Galaxy Young 2 G130HN with Insert SIM Card Problem. This problem is causing the device not to accept or detect any kind of working SIM card module being inserted to it and it only shows on the display that No sim card inserted or insert sim card. You may start by checking the SIM card pin connector for possible damaged or lifted. Check if it needs a re-soldering or just cleaning. 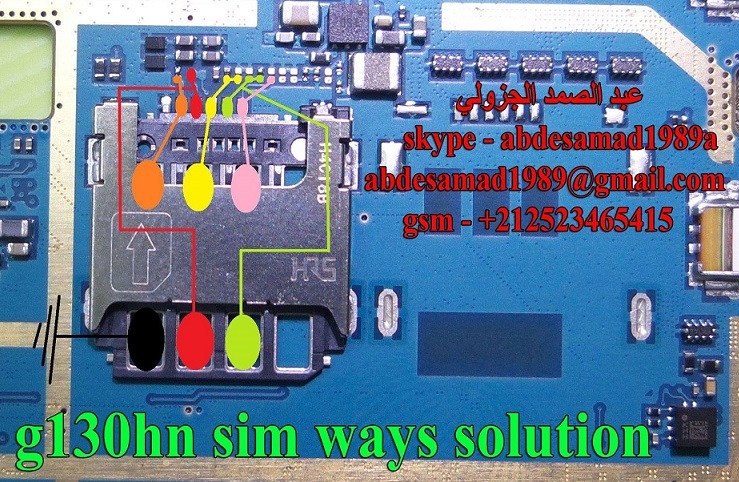 The colored line paths represents each of the corresponding SIM card connector pins, just do trace each of them carefully then mend to reconnect if somehow there is open or cut connections. Check each of connected capacitors , replace if already damaged. First thing you need to do is make sure that just dust or rust is not causing this issue clean the Samsung SM-G130HN SIM card connector and check if all the legs are in good shape, if there is any kind of damage to the SIM Card connector replace it with a new one.